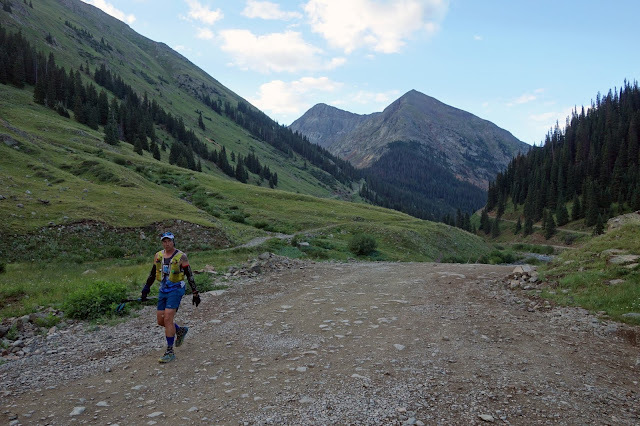 A couple of weeks ago, my friend Roger asked whether I'd be interested in joining his Hardrock 100 crew, as a sort of liaison / shuttle driver. I think Roger would readily agree that it's ridiculous for any amateur race runner to require an entourage, but the overarching idea behind crews and pacers (at least outside the sharp end of competition) is a fun weekend for everyone involved. 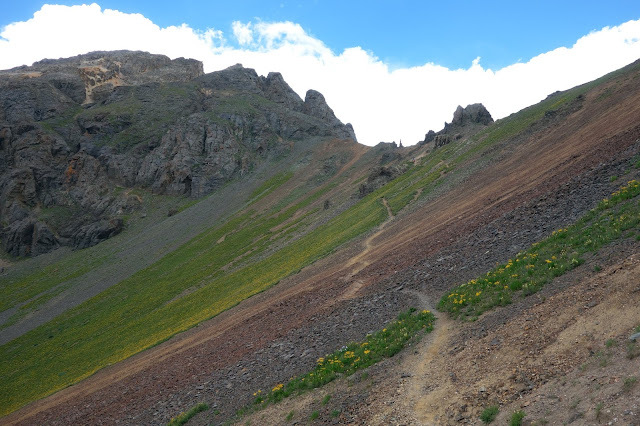 My desire to actually run Hardrock came and went a few years ago — the exclusivity of this race turns me off a bit, and I'm now operating under acceptance that I am a terrible mountain runner whose only unfulfilled racing goal left in life is to finish the Tor des Geants (oh, and Iditarod Trail South Route.) Still, I love lurking on the periphery of these events. It's a sort of interactive front-row seat to an oddball soap opera full of drama and intrigue. 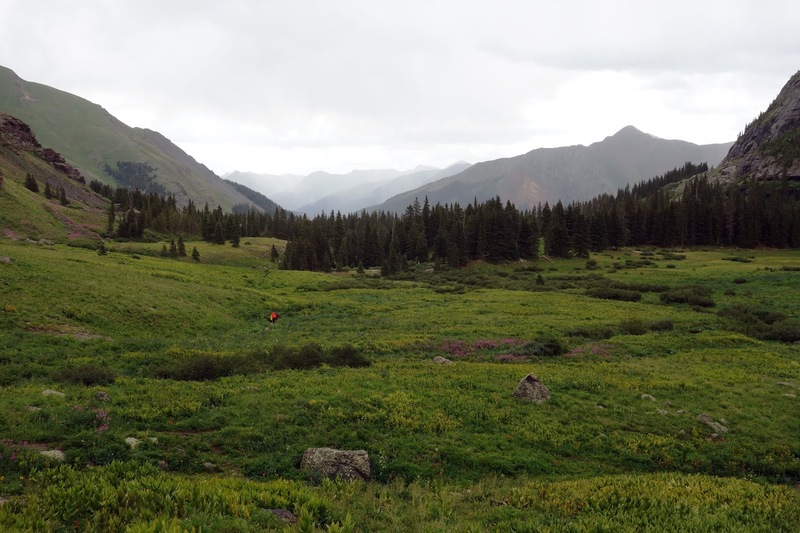 On Thursday I headed toward Silverton, hoping to tag a mountain on the way. When cramming an adventure into an eight-hour drive with a deadline, proximity to the highway and straightforward routes are paramount, so I chose Mount Harvard. At 14,421 feet, it's the third highest peak in Colorado and fourth in the contiguous U.S. The standard route gains nearly 5,000 feet in 13 miles round trip, so it's not exactly a brief jaunt. But it is solid trail, even through the talus, with only about 50 meters of scrambling. Easy peasy. I was having a good day — no labored breathing, and a reasonably relaxed pace that got me to the top in 2:48. 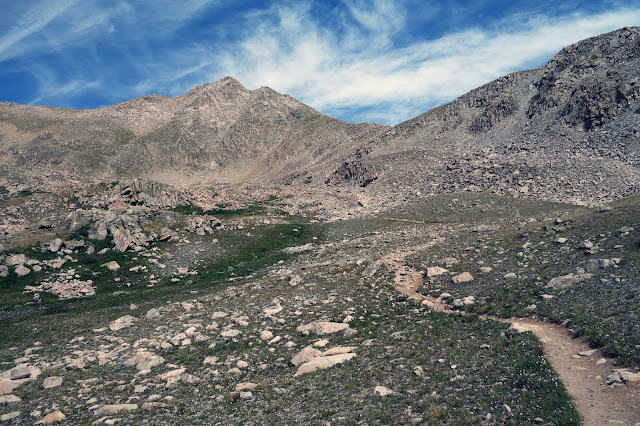 The mountain was all but abandoned on a late Thursday morning — I saw three other hikers above tree line — and the weather was unbelievably ideal. Temperatures were in the 70s and there wasn't a wisp of dark clouds or a breath of wind. About a mile from the summit, I smugly thought "I've been hiking less than two hours and there's only a mile left." Then I switched my GPS screen to altitude and realized I was still below 13,000 feet. Oh. That last mile is blissfully brutal, with the soaring altitude and frequent 45-percent grades. Although I was breathing well, my body still felt like it was being crushed by an invisible force, and I ran out of water more than a thousand feet above the nearest creek (because I'd frozen two liters of water overnight, and six hours later most of it was still ice. Doh.) So I was chuffed when I still hit the top in under three hours, and grateful that I'd budgeted six for the trip. It took me just as long to walk down — between the mild dehydration and altitude, I was a little too nauseated to do any running. 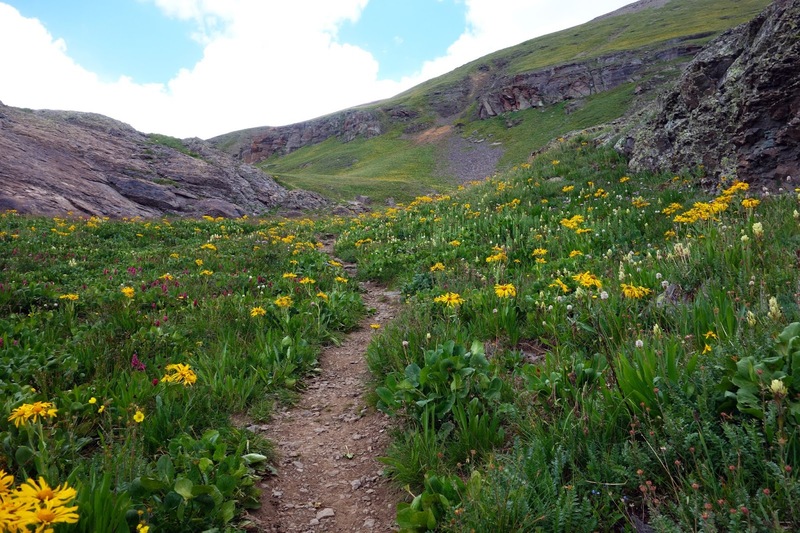 The Hardrock 100 started at 6 a.m. Friday, under clear skies and what I imagine for runners were disconcertingly warm temperatures. 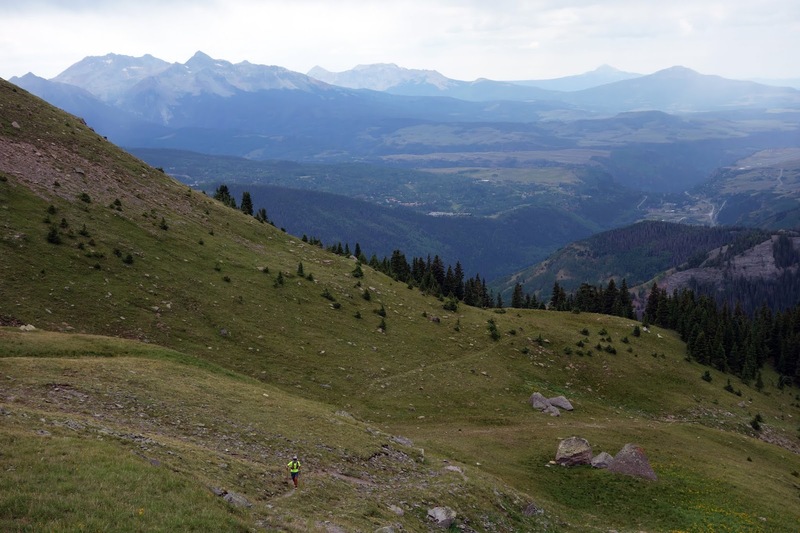 A hot day on these high mountains does not make for a comfortable run. This photo shows Australian contingent Andy Hewat and Roger Hanney. Our crew for both of them was Roger's girlfriend Hailey, Andy's daughter Larnie, and me, token American with cultural and geographical understanding of the region. 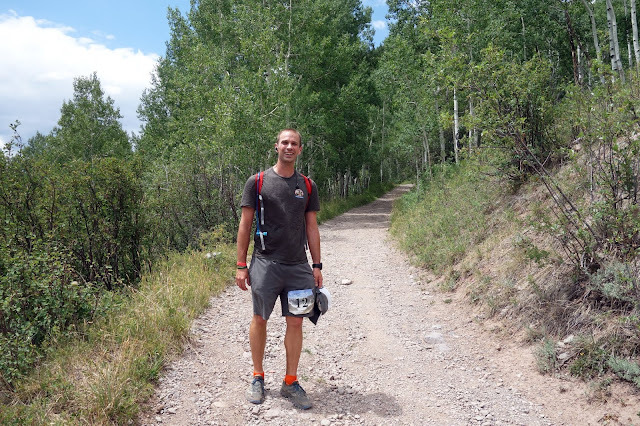 Also on the periphery of our entourage was Jean-Luc Diard, one of the founders of Hoka One One who was in Colorado for Outdoor Retailer, and his assistant Amanda. Jean-Luc contacted me multiple times to connect with Roger but became more of a ghost, filtering in and out of view while embarking on his own strange adventures. But Amanda was welcome company late in the race. Larnie, Hailey and I drove the rented camper van around to Telluride. With several hours to kill before Roger's arrival, I headed up Virginius Pass to spectate the race leaders. 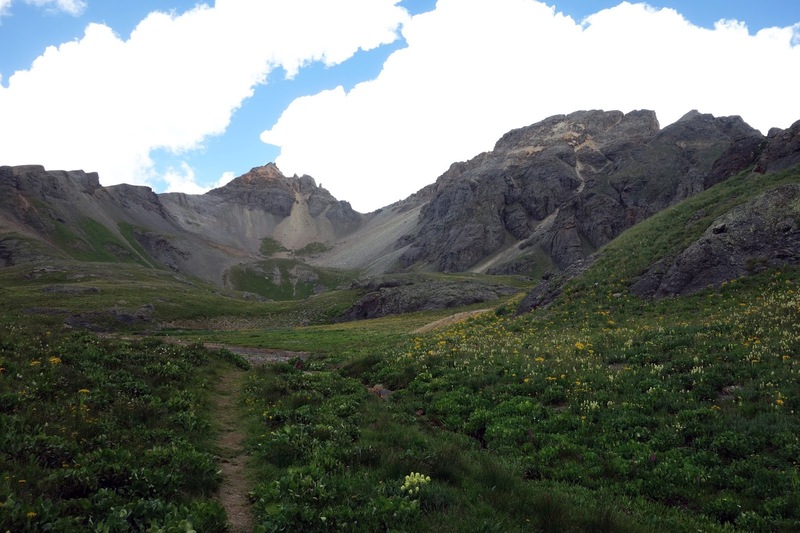 Among the Hardrock crowd, Virginius is a famously steep and rubbly pass, but I was going up and down the "easy" side — only 4,000 feet of climbing in eight miles round trip. There were still a few sphincter-clenching traverses near the top, only because I hate loose scree and sand on steep side slopes. Good views, though. The weather had been iffy with bursts of rain (surprisingly no thunder, though.) I didn't linger long at the top, not wanting to descend the steep rubble in wet conditions. With the rubble behind me, I caught my first glimpse of the race leader, Xavier Thévenard. What struck me most about him in this section was his body language — hunched and straining, and his breathing — noticeably labored as he passed. Clearly he was dominating the race, but I was surprised how hard he appeared to be working, just a little over 30 miles into 100. Whenever I'm as taxed as he appeared to be, I'm dangerously close to a cracking point. Perhaps he was not as strung out as he appeared, or perhaps that's a key difference between elite athletes and clumsy hikers with asthma. 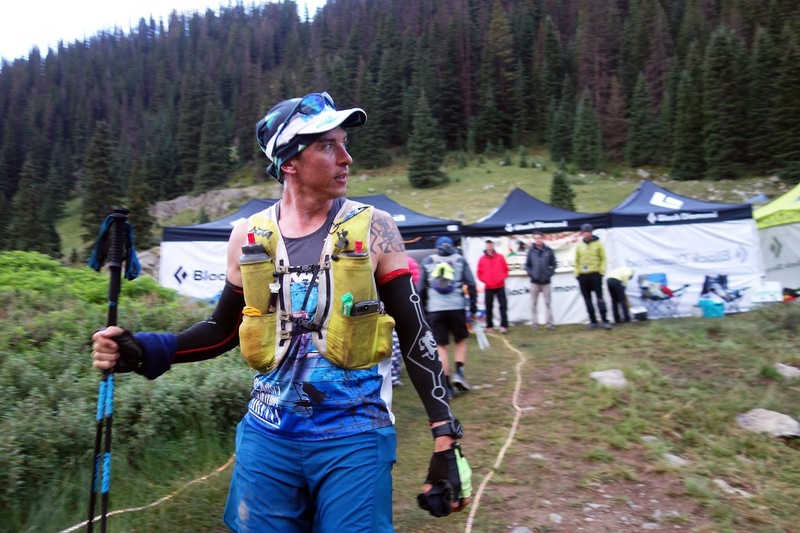 Anyone who cares even remotely about this sport already knows about the drama that went down with Thévenard's disqualification for taking ice and water from his crew a few miles beyond the Ouray checkpoint, so I won't rehash it here. My opinion falls in line with those who believe the consequence was overly harsh for what amounted to a poor choice, but he did break a important rule necessary to establish more fair parameters for all of the competitors. Crews and pacers are a unique aspect of this sport. Ultrarunning requires complete self-sufficiency in extreme environments, then allows moments where an entourage of people are removing your shoes, spoon-feeding you soup, and massaging your legs at designated spots. I find it humorous, and a little bit ridiculous. Although I truly enjoy being a crewperson or pacer for friends, I'm not as inclined to use them myself. Of course I've had pacers in the form of Beat running entire races with me, and there was the Bear 100 sleepover party with my friend Danni. But I tend to shy away. There's a lot of satisfaction to doing something near your personal limit and entirely on your own, as I experienced when I gutted my way through the 350-mile Iditarod Trail hike this past March. Eventual race winner Jeff Browning. He was more than a mile behind Xavier at the time, but appeared much more relaxed. Eventual second-place finisher Jeff Rome. All of these guys were more chatty than I was expecting, asking me how my day was going as they hiked past. 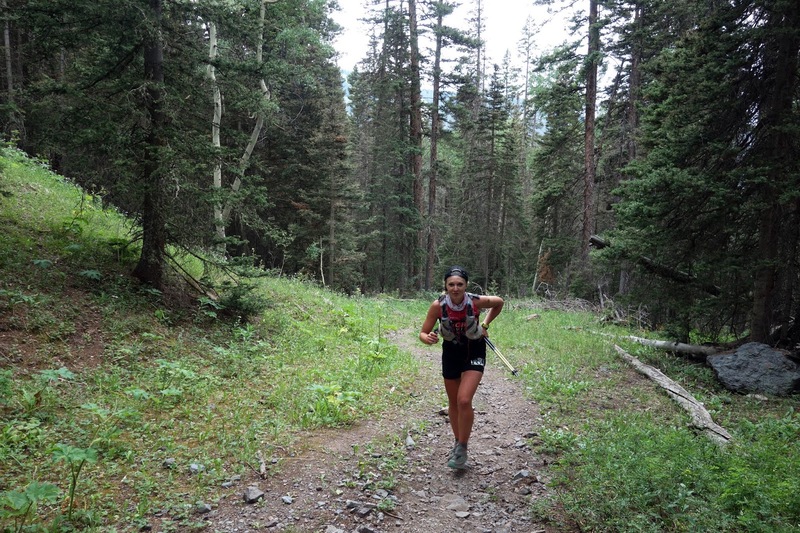 Eventual women's winner Sabrina Stanley. I asked if I could take her photo and she responded, "Oh, my mouth is full, let me finish chewing." I admittedly did not let her finish chewing, as she was moving too quickly to wait. Bryon Powell, editor of iRunFar, with whom I spent some time in Fairbanks before the White Mountains 100 last March. At one point during that week in Alaska, he did a training run on soft, new snow and declared the WM100 would be "absolutely harder than Hardrock" if those trail conditions held. 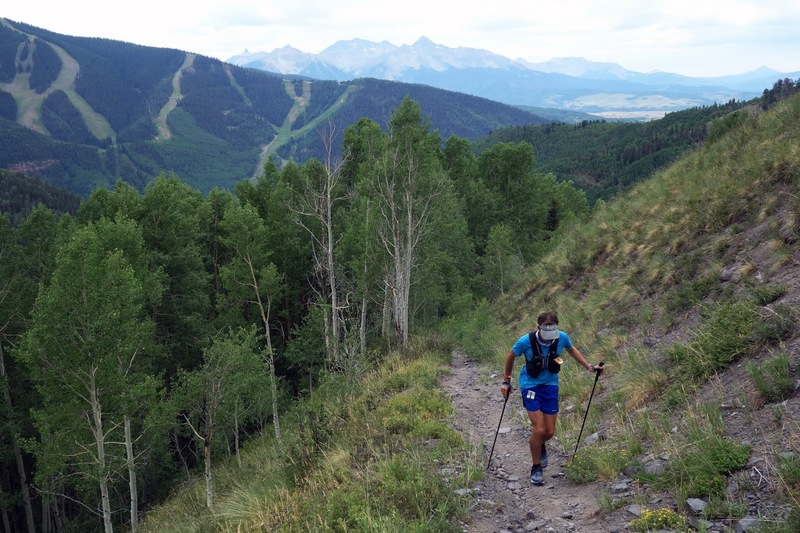 Following this race, I teased him to reassess the two courses, and he admitted that Hardrock is much tougher. Beat's frequent PTL partner, Daniel Benhammou. 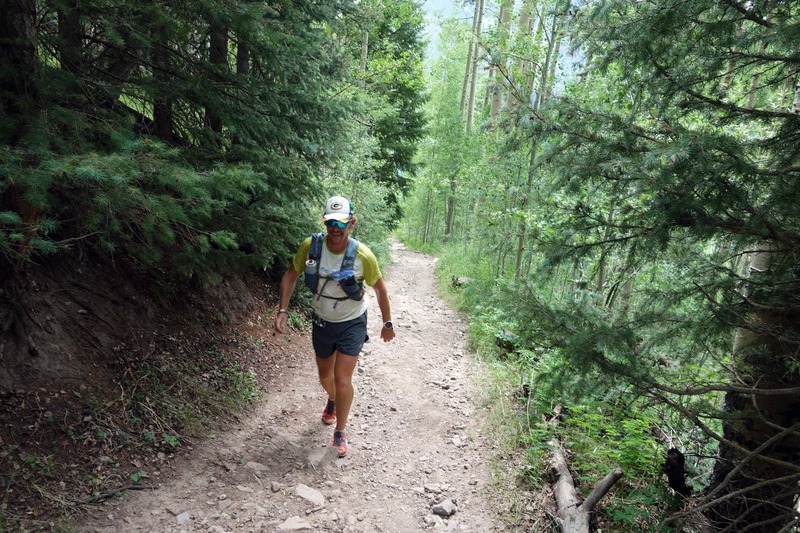 He's run Hardrock seven or eight times, and nearly always finishes between 36 and 37 hours. This year he finished in 37:06. 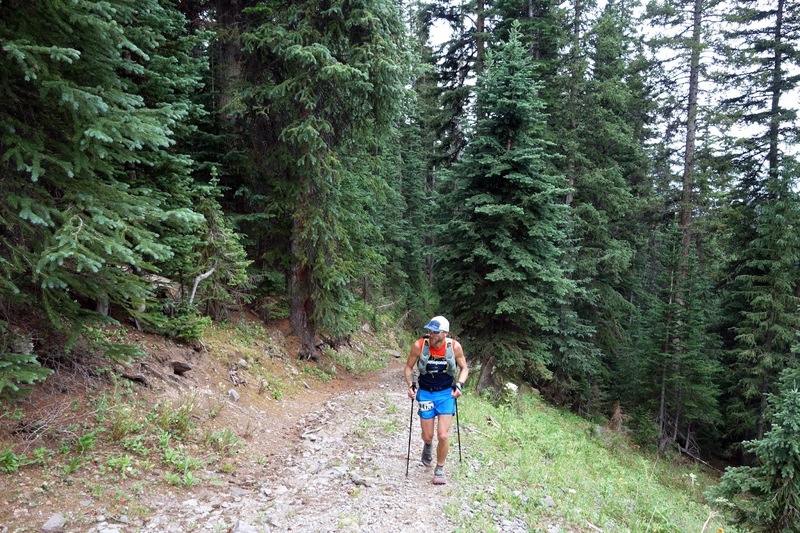 Roger leaving Grouse Gulch, around mile 60, on Saturday morning. Surrounding every brief instance of 10 quality minutes with your runner are prolonged periods of hurry-up-and-wait. 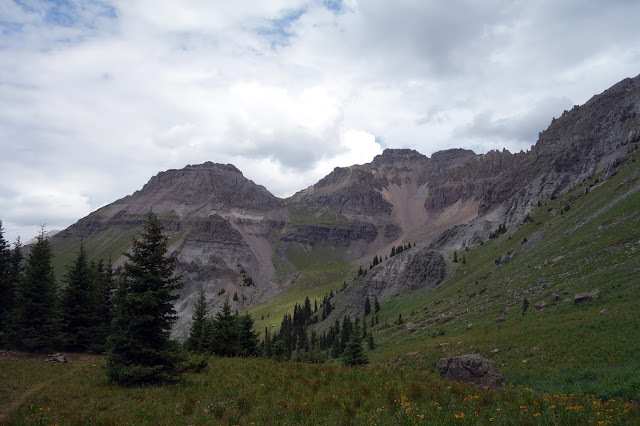 Larnie and I left Hailey in Ouray to pace Roger for a 14-mile, seven-hour segment, grabbed maybe three hours of sleep on the floor of a hotel room in Silverton, and then fired up the camper van for the rugged approach to Grouse. Along a narrow bench with a cliff on one side and a gorge on the other, we encountered an oncoming vehicle around a tight corner, where neither of us had enough space to yield. The other driver pulled over as far as possible and I attempted to creep around him, but misjudged the clearance on this unfamiliar vehicle, so the front wheel slipped into the embankment. Larnie yelped, no doubt aware that she was about to die in a fiery explosion, but I yanked the stick in reverse and managed to recover it before we toppled down the gorge. Scary. Roger rolled in looking sleepy but strong. After a few bites of food and a 20-minute nap, he seemed good to go. Team Australia Crew did serve a more useful purpose when Larnie's dad stumbled in, declaring his intent to quit. 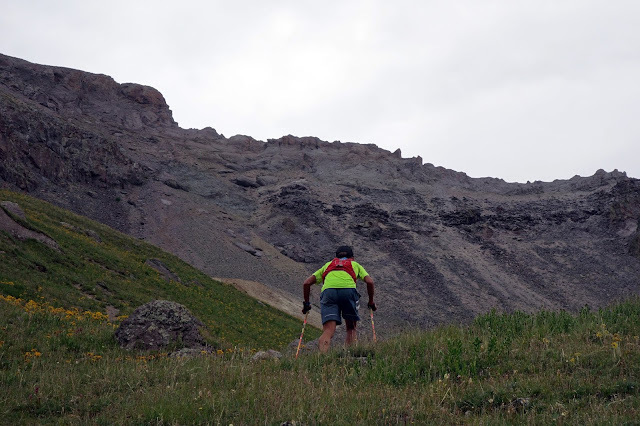 He hadn't kept any food down since Ouray, and couldn't fathom the next 40 miles. 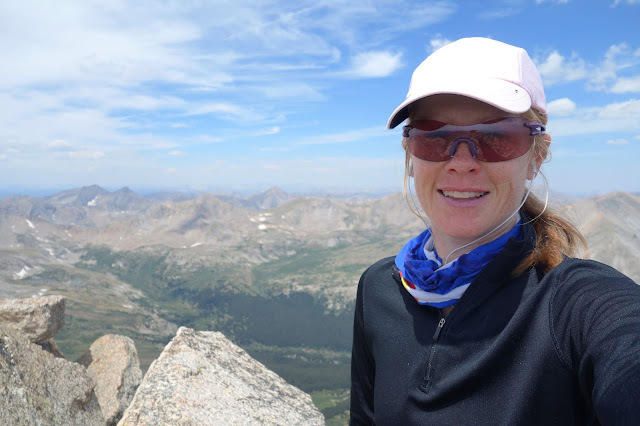 Hailey is a personal trainer who has a relaxed but insistent coaching style, and laid down direct orders involving sleep, soup and a rough plan for the next climb. Andy ended up leaving Grouse, something I'm skeptical he would have done on his own. In Silverton, Hailey and Larnie went back to bed, which is something I suppose I should have done. But it was another beautiful morning, and I wanted to check out another iconic Hardrock setting that I haven't yet seen, Grant Swamp Pass. 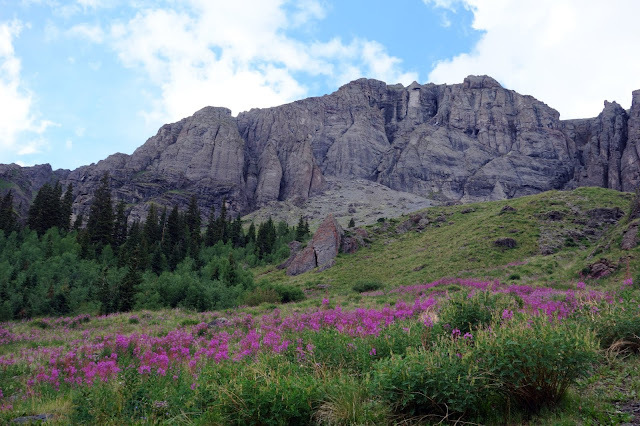 This hike has huge scenery bang for your buck, and popularity to match. Even though I live in the Front Range, I haven't hiked through crowds that thick in a while. Worth it? Yeah, worth it. Nearing Grant Swamp Pass. The colors in the San Juans are unreal. Cloud cover washed out some of the intensity, but it was beautiful nonetheless. Views from Grant Swamp, looking toward the zig-zagging ascent to what I believe is Oscar Pass. 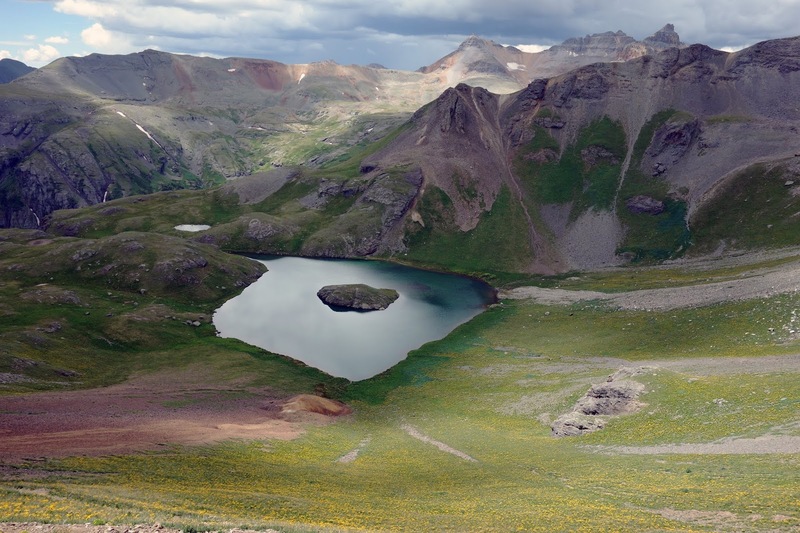 The iconic Island Lake, shadowed by the nasty clouds that were bearing down on me. I intended to climb a small peak above Grant Swamp Pass, but sudden thunder claps prompted a quick retreat instead. 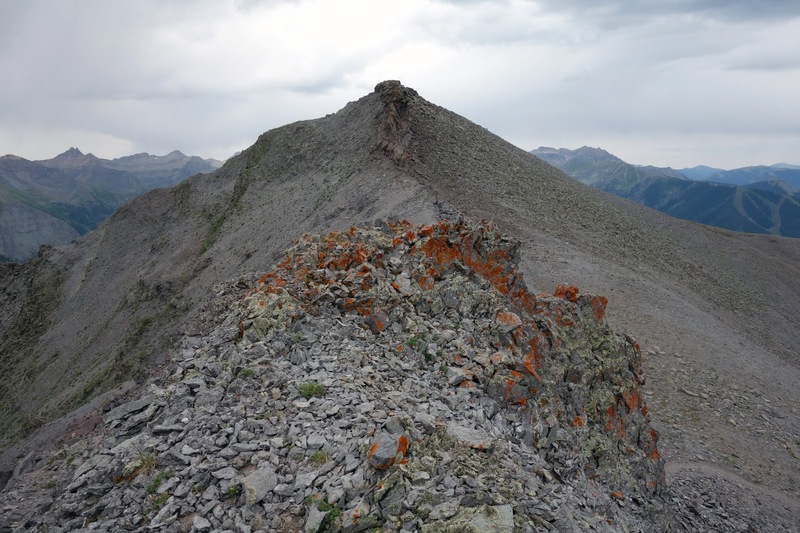 Two people on the ridge above the pass decided to bound down a scree slope directly toward me, knocking several not-small rocks my way. One rock sounded so close that I dropped onto the narrow trail and put my hands over my head, sadly my only defense. As soon as I stood, I went off on a screaming rant that would probably alarm and amuse anyone who knows me as my usual mild-mannered self, then took off running down the trail. Between the thunder and the idiots on the scree, my adrenaline surged to near record highs, and I was off the mountain in an instant. Perhaps I can learn to be an efficient downhill runner — I just need to operate in a persistent state of high stress. Back on the tundra, my adrenaline calmed and the worst of the storm moved away, so I took the opportunity to detour over to Ice Lake. Along the shoreline of Ice Lake, all anxiety and anger washed away completely, and I felt satiated and tranquil. So blue! Photographs under the overcast sky do not capture the intensity of the blue, but the otherworldly hue had a calming effect that was greatly appreciated in my sleep-deprived, slightly strung-out state. The clouds settled in and it rained for much of the descent. I was surprised to see many of the folks I'd passed early in the climb, before I detoured up Grant Swamp Pass and Island Lake, still working their way up to Ice Lake amid the rain and thunder. In the evening our crew — now four women in an amusing state of overtired silliness — headed to the final checkpoint at Cunningham Gulch, mile 91. Roger had been moving so well that we anticipated seeing him before sunset, rather than previously anticipated midnight. We watched an eerie sunset as ominous clouds gathered (sadly I have no photos of this on my camera, even though I was certain I took some.) Then the lightning started — blinding bursts followed within a second by deafening thunder. This storm was very close. Roger, I knew, was somewhere along the high traverse above us, well above treeline. My heightened state of stress came roaring back. Hailey mused that she was worried about Roger being cold, and I said nothing, because I was worried about Roger being a lightning rod. We huddled in the camper van and the storm continued raging for more than a half hour — longer than I've ever sat directly underneath an electrical storm that refused to move on. Twilight faded to darkness, the patter of rain quieted, and we emerged finally to clearing skies. We stood under the open hatch and watched moonlight stretch across rain-saturated cliffs. The air was still, and I was viscerally reminded of the Iditarod Trail earlier this year, when I walked through the subzero night beside the moonlit cliffs of the Happy River Gorge. This became one of my favorite experiences ever. But I couldn't quite relax and relish the memories, because Roger was now overdue. An extra half hour passed. Then another. Finally, we saw a headlamp bobbing far overhead along the cliffs. Hailey called out "Cooo-eee!" — something I've only ever heard my friend Leslie shout when hiking in bear country, but just learned is a common Australian bush call. To our relief, the person on the cliff called back in his distinct tone, "Coooo-eeee!" He hit the final descent, hundreds of feet overhead, and took off at a full sprint. 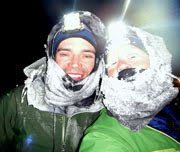 The headlamp was flying down the rocky trail and we heard an amusing barrage of shouting and cursing: "$@! *@# LIGHTNING!" 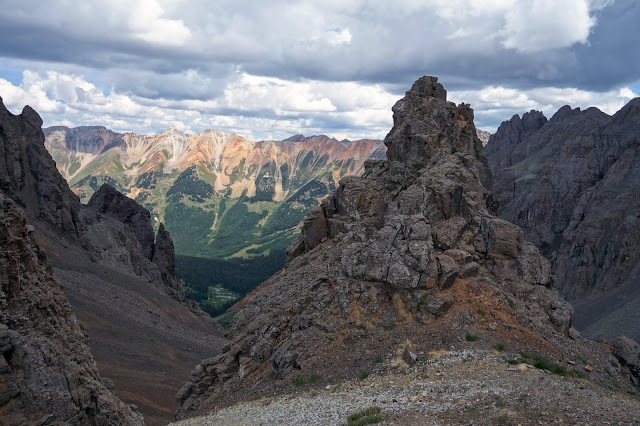 Turns out Roger and several others hunkered down in a depression on the other side of the ridge as the storm raged all around, throwing bolts into the valley both below and above them. They'd been above treeline for hours, so hunkering down near rock outcroppings was their only option. 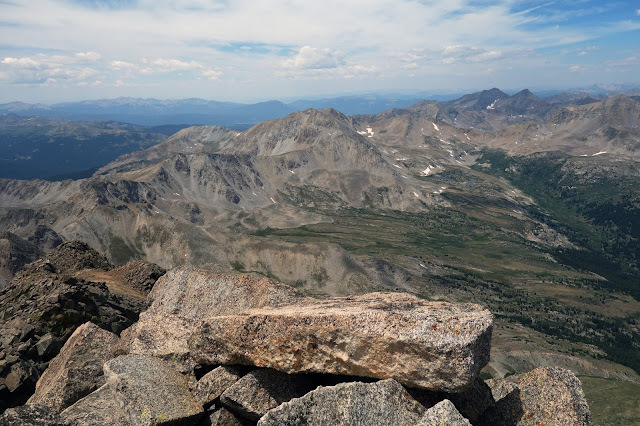 I've been there before — just a few meters below Utah's highest mountain, Kings Peak, in the Uintas — and few experiences of my life have been more frightening. This is another reason I have little desire to run Hardrock. I'll just stick to smaller, more escapable doses of Colorado mountains, thanks. 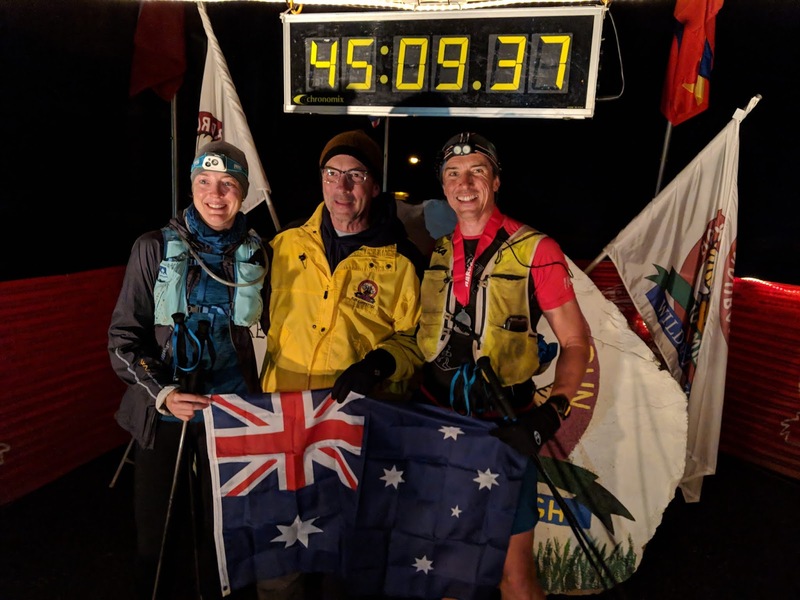 Hailey joined Roger to pace the final segment, and Amanda and I loaded back into the camper van to wait for them at the finish. Along the rough road out of Cunningham, we encountered a runner far off course, who turned out to be our friend Dima. Dima escaped from the storm down a drainage and then followed a jeep road to Cunningham. He told us he was lost and asked where the aid station was. It all happened quickly, and Dima walked away before I had a chance to clarify anything. My assumption at the time was that he was already out of the race but refused a ride just in case he could return to the spot where he went off course. Another vehicle drove toward us, so I waved them down and asked them to relay the news to his wife, who was no doubt also worried about him being overdue. 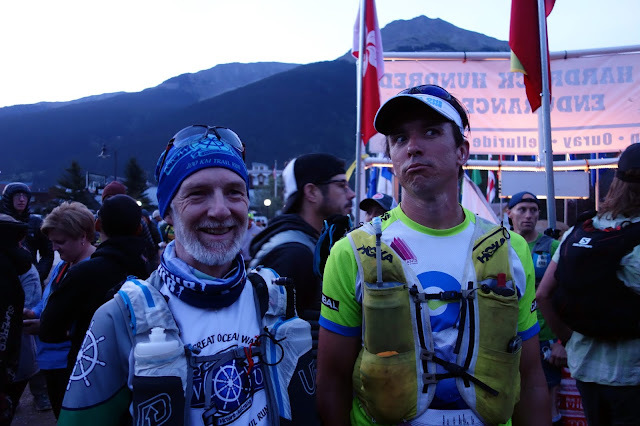 They alerted the aid station volunteers about Dima's situation, and he found himself disqualified by the time he'd arrived. He was supremely unhappy about this, but accepted it and went on to finish the race — unofficially, but he traveled the whole distance under his own power. It was an admirable move, but I inadvertently found myself mixed up in his upset about being only the second person to be disqualified from Hardrock, ever, and may have lost a friend. Andy became the runaway Cinderella story, though. After barely leaving Grouse Gulch, he surged for a while and then faltered again. By the time he reached Cunningham, it was just 11 minutes before the cutoff. Although the cutoff is 2 a.m., it's generally accepted that at that point, traversing the final section in four hours is almost impossible. It took Roger four and a half, while feeling good. As the clock crept toward 6 a.m. and we waited for Andy, I went through the chart to assess how long that segment took most of the runners. There weren't many sub-four-hour segments after those who finished in 36 hours, let alone 48. We stood in the emerging dawn, watched, and waited. Andy's daughter was so nervous. Finally, a headlamp rounded the street corner. With less than four minutes to spare, Andy sprinted full-speed into the finish with his Kiwi pacer in tow. It was a beautiful moment, of which there are many in an event such as Hardrock. Thanks, Roger, for the opportunity to tune in this year. I hope to catch the next episode. Beautifully written! I have to get out to the San Juan’s. Incredible photos! And what a story. Congrats to Roger and especially to Andy! 4 minutes to spare!! Excellent reporting! Jeeze, I hope you didn't lose a friend over an honest attempt at helping out though. Love Ice and Island Lakes...and your reporting on one of our biggest "local" races. 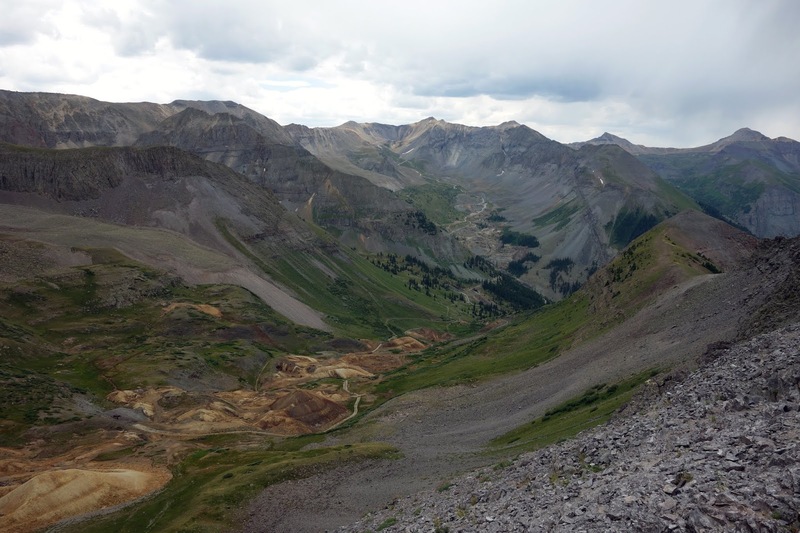 Next up the Ouray 100...Sneffels Marathon, Imogene Pass. Like how you make the most of your little weekend getaways, even when volunteering! We're in town for Ouray 100 this weekend! I have another whirlwind of crewing Beat, but I hope to hit the Bridge of Heaven tomorrow. Is there anything else near town I should try not to miss? I had no idea "Coooo-weeee!" was an Australian bush call. Leslie's is deafening! I full on jumped into the air the first time I heard her do that when we were hiking toward Sulphur Mountain in Banff. She gives no warning! Great story, Jill. I love Andy's finish: a 4-hour dash to the finish and a finish with 4 minutes to spare! That's how I finished the White Mountains 100 (though I doubt my last segment set any speed records except my own). Congrats to Andy! (and Roger, too). P.S. So, how did you get around the other vehicle on the approach to Grouse? You didn't exactly leave us with a cliffhanger (nyuck, nyuck), but you didn't explain how you guys passed each other. Ha! It's not that interesting. After I backed up, the other driver and I had a standoff for another two minutes or so. I was inching backward but there was only black abyss behind me. As winding and narrow as the road had been along that bench, there was no way I was going to drive blind in reverse for long. I was about to get out of the car and talk with the other driver when he finally relented and backed up. Turns out he was only 50 yards from a pullout and the entire exchange was unnecessary, had he only pulled over a few seconds earlier. Sigh. Good story! Of course, if he had pulled over a few seconds earlier you wouldn't have a great story to tell! Mountain driving "etiquette" gives the uphill driver the right-of-way since it can be much more dangerous backing down a steep, narrow road. But common sense and courtesy applies too--like taking advantage of a nearby turn-out. In the "old days," it wasn't unusual for the more experienced driver to back the other person's car if they didn't feel safe doing it themselves. PS: Do you know why Ice Lake is so blue? To be fair to the other driver, I did not see him until I swung around a final blind corner, and I suspect he also had no view of me before then. Just one of those things on a very narrow and rocky bench road that doesn't usually see much overnight traffic unless the Hardrock 100 is happening. The only way I would have been able to back up very far is if someone with a flashlight stood near the passenger-side window and directed me for every inch. There was zero visibility. So I'm lucky the other driver had that pullout behind him. 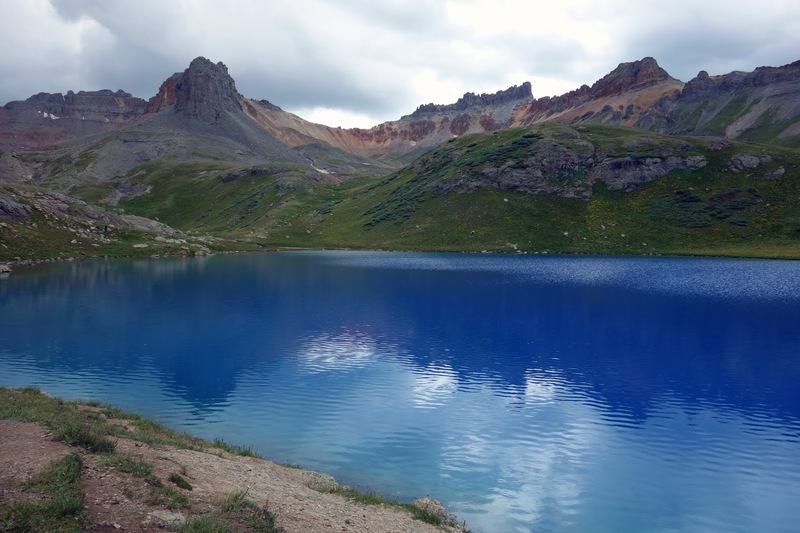 I was curious about Ice Lake too and found this on a local travel Web site: "Upper Ice Lake is a glacial tarn—a lake carved and fed by glaciers—that gets its near-fluorescent blue color from rock flour. When a glacier moves, it grinds the bedrock below, creating a crushed-rock powder that suspends in the water and absorbs the sun’s light spectrum in a way that creates a beautiful cerulean appearance. 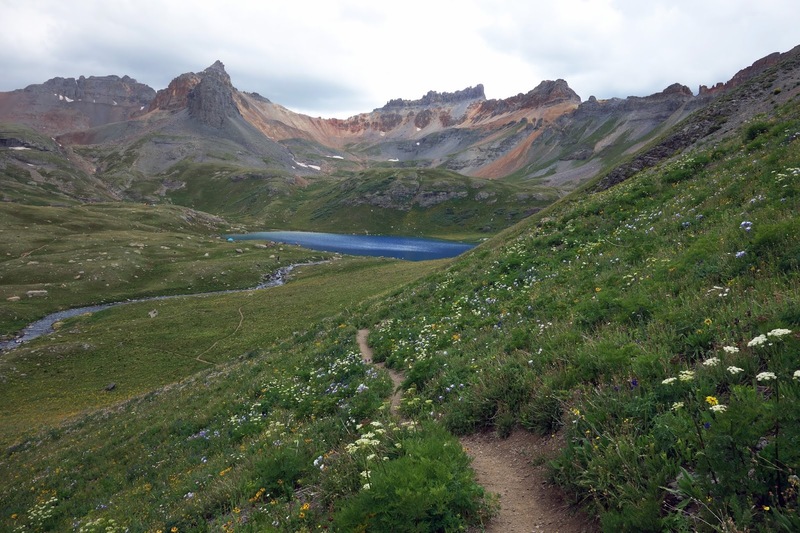 There are only a handful of similarly colored glacial lakes in the state." I've been drinking between a gallon and 2 gallons of water each time I've done weeding work on Mt. Umunhum with temps in the 90s. Wow Jill! Those photos of Ice and Island Lakes were amazing! I think you had the right idea about HardRock. Skirt around the periphery, see the best views, get the heart rate up a little to have some fun but at the end of the day, still stay sane. Go the Aussies! !